How did we go about incorporating green into this room? Here are some steps we took to creating our color palette. First we looked for inspiration; Pinterest offers many great options for color. 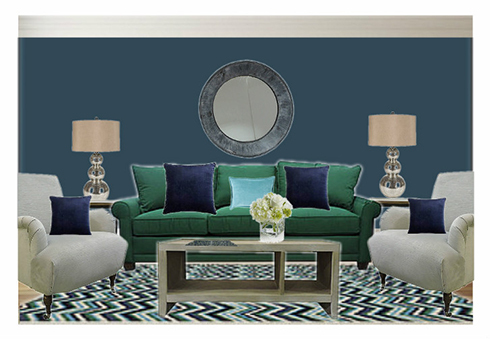 We searched green color palettes and found a color combination of aqua green, grey and navy; next we looked for a rug with color and pattern to coordinate with the sofa. We found this super fun chevron patterned rug from Surya with all our palette colors, it set the tone for the entire room and looks great with our sofa! We selected the paint color Gentlemen’s Blue from Benjamin Moore; this color makes a great accent wall behind the green sofa and softens the green. To keep the space feeling modern, we found several accent pieces with a gray washed finish from Aspenhome. Keeping within our palette, we found this stylish grey side chair from Belfort Basics. As a focal point, we added a round zinc wall mirror and finished off the space with distressed silver lamps and layered in solid pillows. If you're challenged when it comes to selecting a color palette for your space, consult with one of our sales associates when shopping at our Clearance Center and Warehouse at 22250 Shaw Road, Sterling VA 20166. Our design specialists are here to help guide you through the design process!